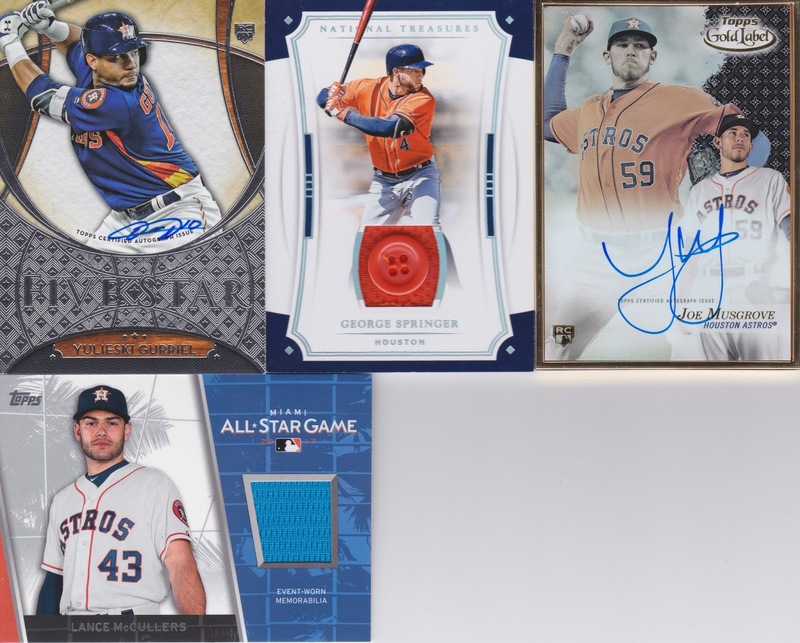 One of the guys I follow on Twitter regularly posts updates of his eBay listings and I took some time delved through them to see what Astros I could plunder. And plunder I did! I snagged me some great deals, and because we've traded several times and knew me, he accepted my offer - which was quite a bit below his asking prices! First of all, Yuli - you signed in absolutely the wrong spot. Should have been down in that silver area... but eh, it's a nice card! HOW ABOUT THAT BUTTON!!!!! This is my second button relic and both of them are Springer cards from National Treasure. The other is from 2014, this is 2017. I love button relics, and find it odd that it took them as long as it did to start including them. This is one is /5. Next, the Joe Musgrove. I'm torn on Gold Label. I LOVE these gold framed cards, but I liked them more when they were special and /10. When they are /99 or more, just doesn't seem right. And finally, I got to add another McCullers relic to my collection. Don't see as much of his stuff as I would like in products. Topps and Panini, I expect you to correct this!!! I love it when guys (or gals) sign in the non-designated spots. That button card is fantastic. Still waiting to add one of those to my collection one day. Oh, and a VERY belated congrats on your boys winning the World Series this year. Having had my guys do the same the year before, I know how special it is to have a team you stuck by through the good times and the bad finally win it all. They (and you) definitely deserved it. My Secret Santa Has Arrived!